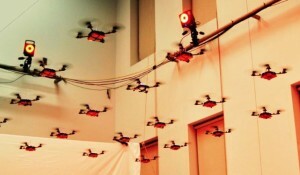 I’m surprised we haven’t heard more about small, prosumer drones being used to attack people. Most security teams focus on ground-based ingress and egress routes, i.e. how someone in a car or on foot can get to their location. Having threats come from above is going to be a serious pain. It shouldn’t be difficult—or expensive—to procure a group of like 20 of these things to use to attack targets. You could literally have a target sitting in a coffee shop, with five guys around him, and have 20 explosive-laden drones drop on him in seconds. That’s just thinking of the big kind—but what about the tiny ones? I can definitely see mini, directional explosives and poisons being used for attacks in the near future. Sadly, it’s not just a matter of professionals using these things to hurt people. Think about this: What are the main reasons more people don’t physically attack others? Well, what about when you can simply fly an explosive or acid laden bot into someone, from across the city, at like 60 MPH. Or their car. Or their house. Cost to the attacker? $150. We’re not there yet, but we’re getting close. So now the girl who hates that other girl can simply get on social media and hire someone to drop a dozen drones on her. Or the attackers who do the business can monitor social media for feuds, and offer their services. If you don’t think this will happen, you’re not paying enough attention. I see a new market for jammers emerging. Probably a good space to get into.